^ Safrai, S. (1969). 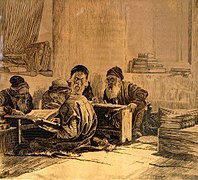 "The Era of the Mishnah and Talmud (70–640)". In Ben-Sasson, H.H. 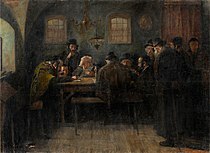 A History of the Jewish People. Translated by Weidenfeld, George. Harvard University Press (published 1976). p. 379. ISBN 9780674397316. 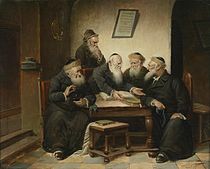 ^ Goldberg, Abraham (1987). 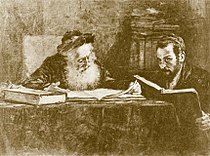 "The Palestinian Talmud". In Safrai, Shmuel. 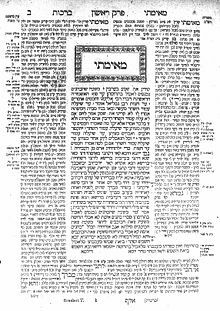 The Literature of the Jewish People in the Period of the Second Temple and the Talmud, Volume 3 The Literature of the Sages. Brill. pp. 303–322. doi:10.1163/9789004275133_008. ISBN 9789004275133. ^ Yaacov Elman (2012). Steven Fine; Shai Secunda, eds. Shoshannat Yaakov: Jewish and Iranian Studies in Honor of Yaakov Elman. Brill Academic Pub Publishers. ISBN 978-9004235441. Retrieved 11 November 2013.